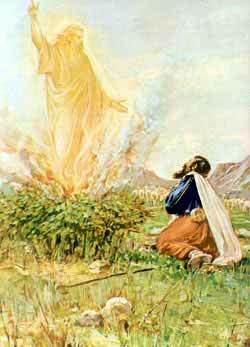 God speaks to Moses from out of the burning bush. MOSES WAS BROUGHTup in the court of Egypt. But when he was about forty years old, he went among his own people again, and was grieved to find how sadly they were oppressed by the Egyptians. Once he saw an Egyptian ill-treating a Hebrew; so he killed the man, and buried his body in the sand. The king would have put him to death for this, but Moses escaped into the land of Midian, and dwelt there. One day, when he was feeding his flock near Horeb, God called to him out of a bush that flamed with fire, and yet was not burned. And He told Moses that He had seen the sufferings of the people of Israel, and would deliver them, and bring them into the good land of Canaan, as He had promised to Abraham. And He commanded him to tell Pharaoh to let the people go, that they might serve God in the wilderness. He also appointed various wonderful things to be wrought before Pharaoh, that he might know that He who had sent him this command was the true God, whom he and his people ought to worship. Moses was very unwilling to go to Pharaoh, for he thought the king would not heed what he said; but God would have him do it, and also told him to take his brother Aaron with him. So he went; and when he came before the king, Pharaoh asked who the Lord was that he should obey Him. And he told Moses and Aaron that they hindered the people in their work by telling them about their God wanting them to go and sacrifice to him in the wilderness. It was only because they were idle that they wished to do so. They should not go. And he ordered that more work should be given them than before. The Hebrews had been making bricks of clay mixed with straw. So Pharaoh commanded that no more straw should be given them, but they should get it for themselves where they could; while, at the same time, they were obliged to make as much brick as when straw was found for them. But, instead of making bricks, their time was now spent in seeking straw; and they were beaten because the usual quantity of work was not done. The poor Hebrews were very sad, and bitterly reproached Moses and Aaron for making their condition so much worse than it had been. And though God assured them, by Moses, that He would certainly deliver them out of Egypt, they were so unhappy and faint-hearted that they would not believe it. This entry was posted in Discipleship and tagged Aaron, Egypt, Egyptian, God, Israelite, Midian, Moses, Pharaoh. Bookmark the permalink.